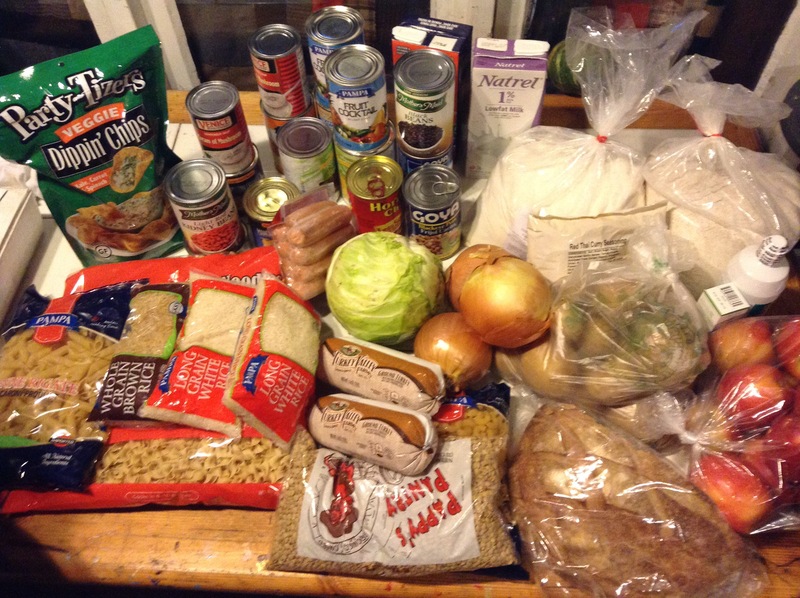 A couple of weeks ago, I asked readers to tell me what they get from their food bank. I got hundreds of answers and what I heard was exactly as I expected but maybe not what a lot of people would expect? And that was absolutely why I wanted to do this post. I’ve been writing about food insecurity for long enough to have encountered recurring conversations and remarks. I would say it’s a common occurrence to see a person say they don’t have enough food to eat and the overwhelming response they get is, “Go to your local food bank.”. The advice might be coming from someone who thinks this is helpful advice but they’ve never been to a food bank themselves OR they have used food banks before and they’re experience has been excellent. “Excellent” is not what most people would describe their experience as and it’s also important for people to understand that sometimes food banks are not accessible for everyone. But mostly, I want people to understand the limited capacity of what “go to the food bank” might mean for someone. I want to clarify here that this is in no way a diss to food banks. Food banks are an incredibly valuable asset. The people who manage and volunteers at food banks are tirelessly compassionate and caring people. They want people to get enough food and they would rather it be good food. As more states impose restrictions on SNAP and limit who can get it, food banks are crucial but as the number of people who need them increases, the ability to truly help people decreases. You’re hearing from GOP candidates that the best thing we can do for “the poor” is to just get rid of the SNAP program altogether on the federal level and let the states decide how to allocate money for safety net programs. This will have a massive impact on already struggling states where food banks are maxed out on their helping potential. Right now there are people who are trying to feed themselves exclusively from food banks. These people usually are just over the limit to qualify for SNAP (I keep telling ya’ll…SNAP works exactly how it should and needs to be expanded). Some people do get SNAP but the amount is small. People will sometimes have to go to several food banks in their area to make it work. Two people told me they couldn’t use the food bank where they live because the eligibility is based on whether or not you qualify for SNAP and they didn’t. Some food pantries do not deliver and people without transportation can’t make it there. Produce is rare for some,especially in the winter months. This is an important point for foodists to take note of. If you’re advising poor people that it’s easy to eat healthy, you need to be aware that their options are limited. This is what we brought home last Monday from our food pantry. Our’s is a “self serve” pantry and clients get to choose what they want. The amounts are based on a point system for family size. These guidelines are supposed to be a 3-day supply of food per person. This food pantry is open twice a month. What’s available changes. Sorry this photo is blurry but I think you can get the idea. When we go in, we take the card with our family size on it (6 that week because 1 kid went back to college). On the tables, the food is labeled with points. Canned food is usually 1 pt, as are grains. Meats are more….I think the ground turkey was 4 pts. I know a bag of chicken is the costliest at 10 pts. Some items are only 1 per family (especially produce). Occasionally they have non-food items like toothpaste and those are always one per family. From my perspective, this is pretty good. I have never had expired food. Nothing has ever made us sick. I can usually figure out ways to make meals from it , although sometimes it takes a lot of creativity and strict management of resources available. So, that’s my experience with the one we use right now. Amy, Central NY- We have a food bank and a fresh food giveaway. The fresh food giveaway is bread and produce, every once in a while dairy products or eggs. The food bank is toilet paper, pasta, pasta sauce, canned fruit, canned vegetables, mystery poptarts (They’re out of the box and the wrappers aren’t labelled, so you don’t know what kind they are until you get them home and open them. I can’t have peanuts, but so far I have been lucky and have not gotten the peanut butter ones), pancake mix, syrup, tuna fish, rice, beans, lentils, and some vegetable soup that’s bizarrely nasty on its own but that can be put into a stew or something similar. One time the food bank had body spray. And they’ve had agave nectar a couple of times. Elizabeth, Southern PA -…my experience has been mixed. Some only give enough for two days for four. Becky, Vermont (volunteer) – We purchased a walk in cooler for meat and other frozen foods. The amount you get depends on family size. For example, a family of 4 would get around 12 cans of veggies, 12 soup, 12 various types of macaroni, 12 tuna, 10 other meat cans. Two bags of rice, 4 frozen packs of meat…etc. You can come once a month. Fresh produce comes in from the food bank once a month. You would need to be in that week to get it. Eggs we have too. Peggy- Our foodbank also allows only one pickup a month. The only time I ever received meat was the first time that I went. I was turned away by the foodbank itself. A lady came out and told me that the woman in front of me was the last person they would serve. It was two days before Christmas, a snow storm was forecast. I had driven 15 miles to get there…I was nearly sure to almost starve before they opened back up in the new year. A kind woman gave me one of her family’s four boxes. It had a pork roast in it. Brooke,MI-Last time my husband was off work…they asked for paycheck stubs…haven’t been back unfortunately. We did get all the staples. Never any fresh stuff. I can get baby food..diapers and wipes also. Chris, FL- I haven’t been back since we all had food poisoning. I know the bad food came from the food bank because it was the only food we had in the house. Wendy, SLC,Utah- I live in a low income senior apartment building with 80 apartments. Once a month the food bank brings both state and federal boxes. Even the guy who has been distributing the food for many years does not know why some people get state and others federal. I get the state box. Each one is decorated by kids. Sometimes they are quite clever! Boxes were distributed yesterday. I got 4 cans of tuna, 2 small cans of salmon, 3 cans of cranberry juice concentrate, peanut butter, 2 cans fruit cocktail, a box of honey graham crackers, a loaf of oat bread and 6 strawberry Activia bottles. I gave back 2 cans of beef stew, a jug of grape juice and a brick of plastic cheese. We have a free table in the community room, so we can put what we don’t want on it and take something else. I took a bag of powdered milk and an old guy gave me his 6 bottles of Activa Everybody here wishes we got things like fresh meat, veggies or fruits! supplementing their customers groceries, not providing everything. From my recollection, I can’t find the actual lists on my computer. allowances made depending on how deep the shelves were. Baking supplies if we had them, if requested. were free for the picking if they could be used, as well as dry beans. Pam, Chattanooga- The food Bank delivers to a local church once a month. We usually get a frozen 10 lb bag of chicken legs and thighs 5 or 10 lb bag of potatoes some fresh produce a couple of canned veggies some donated baked goods and some other random stuff. In late fall I received a huge amount of end of season produce. Carrots onions and peppers that are in my freezer. This month got a cabbage and a lb of older carrots that cooked up fine in a soup. Last month not much produce but peanut butter and cereal were appreciated. Connie, Lake County ,Ohio- Most of the good pantries are run by churches, and usually the Catholic churches. They divide the community into sections. You have to go to your assigned church. The one we went to for several years, before our recent eviction/move was once every 30 days. Clients choice from each food group. Three day supply for however many people. For the two of us (adult son and I) we usually got 3 soups, a breakfast (pancake mix/syrup or cereal) two pasta, sauce, 3 canned fruit, pb&j, 3 canned veggies, tp, 1 snack, and something frozen- sometimes bagged entree, sometimes hot dogs, chicken, whatever they have. Other items depend on store donations- if they had close date yogurt/dairy, sometimes eggs. Lots of bakery donations, wry depends on how much they got- 1 or 2 bread, a couple cookie/cake/pastry. Occasional “fresh” produce, but lots of times borderline spoiled. Current church seems to have more/better donations. We got quite a lot and also got milk, eggs, frozen leftovers from on site caterer, frozen meat, bread, dessert. They had a snack shelf, coffee/tea, baking products. There is also a produce give away the first Saturday. Last time we got 10 lbs of potatoes, cabbage, onions, apples, watermelon, carrots, grapefruit, squash and some baked goods. Another church does “taxables”. Last Saturday of the month. One month deodorant, shampoo, shaving supplies, along with toothpaste and TP. Next month laundry and dish soap with TP. MJ, Southern IL- We don’t go all the time but sometimes we need to. Usually there is a frozen chicken, or a lb of hamburger, once we got a pork loin, pancake mix, syrup, a few cans of fruit and veg, soup, box of cereal, and spaghetti noodles and a can of tomato sauce. I am always grateful that I can cook. I can turn a sows ear into a silk purse. Sometimes there are out of date things. I always check things out well…we have also gotten sick from chicken. About twice a year they have a thing where they load your trunk. Once we got a case of frozen pineapple chunks…lol…it was summer so they were good frozen treats. Most all of the food pantries here are run by churches…I don’t know of any town around that has a food bank. 4 loaves breads usually I was given more because most folk didn’t want the whole or multi grain healthy bread. I took all they would give and freeze. Sometimes there would be a stick of margerine, or a pack of hot dogs or bologna, maybe a couple of rolls of toilet paper. At Christmas or Thanksgiving the first 25 or so got hams or turkeys. That food bank gave out 2x a month. There were others, but they were in bad areas, and only did evening hours. I found an outlet store that sold dented, close to date food, I was able to make what they had into passable meals cheap. There were too many folks in need,and not enough to go around. Ramen Noodle Nation (great blog, btw) shared these links related to their food pantry excursions- Blog entries on food pantries and gave this update… The mobile food pantry has been better since these were written, last time got a bag of peppers, a pound of sliced ham, stale French bread, some ranch dressing, hummus and chips, lettuce and a few other things. Found a second church community meal. One church food pantry in November 2015, gave us frozen thanksgiving turkey breasts with corn, stuffing, noodles, a box of biscuit mix, cranberry, and soups. We got a similar box in December. Meat seems to always be in short supply and since these were written Squawker can eat dairy if she has a glass of Lactase milk that day. I am a student-parent at a community college in Minnesota. I have a work-study position in which I facilitate Poverty 101, a training program I designed to break poverty stereotypes amongst our student employees (this is needed…just wait for it–the pictures speak volumes). We just opened a new Resource and Support Center this week. The center will help students get connected with basic needs, and houses our food pantry. While we have had a food pantry for awhile, it was located in an empty store closet with no heat. I have included a few photos. The one titled, “Pantry,” is what we used to give out to students–snacks to get them through the day. The photo titled, “Food Bags,” is from our holiday break packs, which were packed with the hope of supplementing a student over winter break. They consisted of a few cans of generic soup, dehydrated veggies, unlabled tuna, pasta, and a couple cans of fruit. Some had sauce and beans, but there wasn’t enough to go around. The photo titled, “Screenshot,” is what was on the posters advertising the break packs. (As you can see, the marketing team hasn’t taken Poverty 101.) Students were upset about the difference between the advertisement and the actual items, but what do you do when it’s your only option? The lack of cultural sensitivity is real, and I am having a rough time breaking down the poverty stigma on campus. Don’t get me wrong, faculty is trying and finally we have administration behind us. But the struggle is real. The distributor the pantry gets their food from recently told our contact that they are having trouble securing food at the prices they need to keep supplying the many food shelves they serve. This pisses me off to no end. We all are painfully aware that food not sold eventually goes into dumpsters, not hungry stomachs. There is no reason, in the wealthiest nation in the history of the world, that we can’t feed everyone nutritious food. Next Next post: Daily Dozen: Links galore.Well, 12 to be exact. Back when I lived in my home city, I volunteered once at a large food depository that distributed through neighborhood food banks. I was with a group of people from work (it was our annual corporate volunteer day) and we were assigned to sort donated oranges from these huge bins on pallets moved around with forklifts. We were trying to package the oranges into bags to be distributed with other items, but there were many oranges in the bins that were already moldy and rotten. That really sensitized me to what it must be like to get a bag of “fresh” produce from the food bank/pantry. Those oranges really needed to be consumed within a day or two of receiving them. I’m not sure how it’s supposed to help people “eat healthy” and get the recommended servings of fresh fruit and veg a day when the produce is nearly rotten by the time they get it. I’m very, very grateful that I don’t have to rely on a food pantry. I actually have no idea! That’s a good question. I am so lucky to live in an area with a good food bank as most of my food comes from there right now. When you go in, you first stop at the fridge case and get a half gallon of milk, dozen eggs, and cheese. They sometimes have yougurt and donated sandwiches (day old) from places like Trader Joe. Then you go to the staples, ie canned good, cereal, pasta. Two people get 3 large paper bags of food here – your choice. This week I got canned pork, canned chicken, and a few cans of tuna. Then you stop at the meat freezer. They almost always have chickens, parts and whole chickens, a variety of donated meats, and fish donated by the fishing alliance. I have even gotten scallops there !! I also discovered that catfish is good ! Usually you get one item for 2 people of meat. Then to the fresh fruits and veges – you get all you want of these and there is usually a good variety sometimes things like pineapple, melon, berries, and almost always bananas. You never know what you will find. It is usually good and fresh. Then day-old breads, again free choice as much as you want. They usually have dog and cat food in gallon ziplock bags – you can pickup to 3 each time you go, sometimes canned foods and/or treats. You can go every other week. They also have a thrift store area where everything is free if you quality for the food bank.